Photo: West Side Church of God, Wichita. A church on the west side of Wichita has been brought to its knees—not in defeat, but in victory. 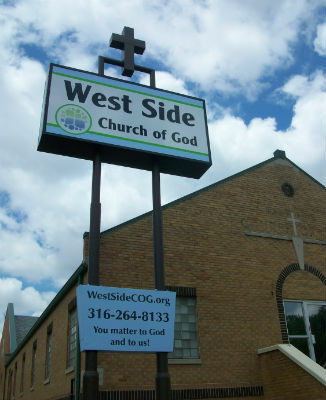 The prayer rhythm of West Side Church of God is actually nothing new, but it’s continually pumping new life and hope into the Kansas congregation. Since last September, the Spirit has drawn an encouragingly high representation of the church into intentional prayer on a weekly basis. For West Side Church of God, it’s pray, teach, serve, repeat! 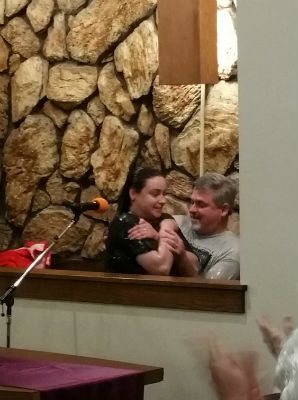 Their consistent prayer life, missional outreach, and clear teaching of God’s Word recently culminated in a day of celebration that left six believers baptized, the body of Christ recharged, and the devil on the run. Like many congregations, West Side has found it helpful to utilize the Book of Common Prayer as a resource. The Daily Office Lectionary has offered useful tools to engage the whole church in purposeful prayer. So when it was time to come up with a creative approach to Easter 2016, West Side Church opted to incorporate prayer throughout. From Monday through Friday of Holy Week, the church gathered for prayer. Each night of guided prayer, interspersed with scripture and responsive readings, moved the focus ever closer to the cross and the empty tomb. What happened on Friday, however, couldn’t have been planned or predicted. “I wasn’t trying to conjure up some emotional response,” Pastor Forest insists. “But on Friday, we ended the series with the gospel of Luke’s account of Jesus breathing his last. It was one of the most powerful things. I mean, how many times as Christians have we read that? But it was dead silence. Nobody got up. Nobody left. Finally, I got up and let them know they could leave if they needed to, but that if they wanted to sit back, that was fine.” Forest explains that even after his formal dismissal, these prayer warriors were in no hurry to leave. This moment with God was simply too poignant, too life-altering to take lightly. 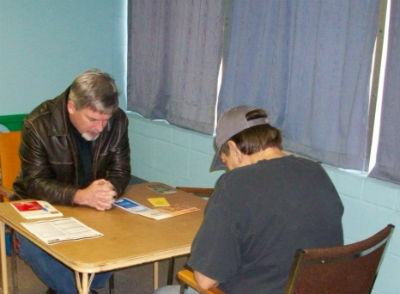 Photo: Pastor Forest prays with a guest of the food pantry at West Side Church of God. Evidenced by a remarkable move of the Spirit among the congregation, the church recently celebrated new life in Christ as six people were baptized. Two were a father and daughter, and two others were a mother and daughter. The entire service was dedicated to the theme of baptism, and after the service, two more believers indicated a desire for baptism. Beyond the church’s prayer ministry, they’re also devoted to monthly outreach through their evangelistic food pantry. And beyond their local sphere of ministry, Pastor Forest is excited about the new day dawning in the Church of God movement, and supports the “Jesus is the Subject” theme. In this new day, one new opportunity for the Church of God is Cry Out to the Lord, scheduled for Sunday, September 11, 2016. Like Pastor Forest’s guided approach to congregational prayer, Cry Out to the Lord offers an intentional, comprehensive prayer experience for any church recognizing the need for a new awakening in the church. Downloadable resources are available, and you can learn more at www.JesusIsTheSubject.org/cryout. This entry was posted in All Church of God, Central. Bookmark the permalink.